Be the first to share your favorite memory, photo or story of Felicia. This memorial page is dedicated for family, friends and future generations to celebrate the life of their loved one. 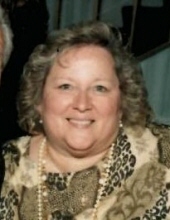 Felicia Ann Malatesta, age 74. Beloved daughter of the late John and the late Ann nee Del Fiacco; dear sister of John (Annette), Ken (Karen) and the late Jim (Diane); fond aunt of many. Visitation Wednesday, April 17, 2019 from 9:00 until 10:30 a.m. at Cumberland Chapels, 8300 W. Lawrence Ave., Norridge, IL 60706, and will proceed to Mary, Seat of Wisdom Church in Park Ridge, IL for Mass at 11:00 a.m. Interment All Saints Cemetery. In lieu of flowers donations to Carmelite Monastery, 949 N. River Rd., Des Plaines, IL 60016, would be appreciated. Info 708-456-8300 or www.cumberlandchapels.com. To send flowers or a remembrance gift to the family of Felicia Ann Malatesta, please visit our Tribute Store. "Email Address" would like to share the life celebration of Felicia Ann Malatesta. Click on the "link" to go to share a favorite memory or leave a condolence message for the family.